Some genres evolve over time, constantly improving themselves, walking the long road from the brutishness of austrolipithicus doomus to the sapience of homo halflifeus, with promising species once in a while vanishing into the Neanderthal, Nukem mists. But occasionally a game genre births us a product so perfect that further evolution can only weaken it. 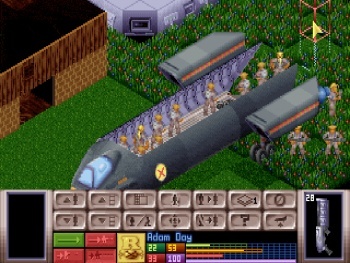 X-Com: UFO Defense is such a game. Over fifteen years after its release, lead designer Julian Gollop's masterpiece remains the definitive turn-based tactical game , with successors like Jagged Alliance, Silent Storm, Shadow Watch, and UFO mere single-celled organisms in comparison. X-Com is perfect: It has no need to evolve. It is a cockroach of playability, unkillably fun, a game that could survive nuclear war and still be awesome. And, since nuclear war is going to be on your mind from all that Fallout 3, you should probably go ahead and plan to buy X-Com before the bombs fall... It's available now on STEAM for just $4.99. Up next: Feel the beat - and ooh, look at all the pretty colors.